Find Better Ideas, Faster ® with a custom world cup trend report, our PRO Dashboard and 80+ categories of premium trend reports. 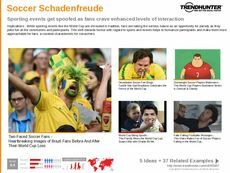 The World Cup Trend Report illuminates the marketing strategies, campaigns and products that are associated with the FIFA World Cup. By capitalizing on pride, nationality and fandom, this sporting event can attract consumer attention to certain products. By creating connections between team pride and product consumption, athletic fashion, footwear and sporting gear brands can increase their sales. 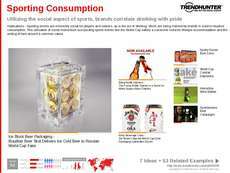 Alcohol brands, especially beer, can also market their drinking experience together with the World Cup. This report has wide industry applications and is especially useful for marketing teams and advertisers in athletic apparel, sports footwear and sporting gear industries. It's also beneficial for alcohol brand and campaign managers who are looking to forge brand and sporting event partnerships. 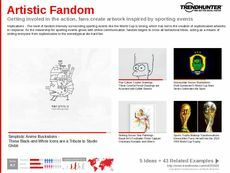 The World Cup Trend Report is a sports marketing resource that outlines the most innovative promotional strategies that involve the global soccer tournament.